No Bake Cheesecake was posted on April 5th, 2011 and is filed under Desserts, Kid Friendly, Low Carb, Recipes. This entry has 8 comments. You can follow any responses through the RSS 2.0 Comment Feed. Before we moved into our house in the country, we had to knock down an old, rotten house that stood where we wanted to build. The house still had pretty much everything still in it…from old dressers, books, dishes, toys, and magazines. Everything was antique and pretty much falling apart, but there were a few things we saved just for kicks. …Including this recipe. We found it in a timeworn Family Circle Magazine that came out when my Mom was only 2 years old. Kind of crazy. But when we leafed through it, this recipe looked so great we just had to try it. It was altered a bit from the original, but barely. The recipe is pretty healthy, but there are a couple ingredients like the organic sugar or cool-whip that I try to keep “just for special”. Like I always say, it’s all about balance. Dessert keeps us balanced. For sure. Mix together the gelatin, sugar, and salt in a double boiler. Beat together the egg yolks and rice milk; add to gelatin mixture. Cook over boiling water, stirring consistantly until gelatin is dissolved and mixture thickens, about 10 minutes. Remove from heat; add the lemon rid; cool. Blend cottage cheese. Then add in lemon juice and vanilla to the cottage cheese. Chill, stirring occasionally, until mixture mounds slightly when dropped from a spoon. While mixture is chilling, make crumb topping by mixing the melted butter, 1 tbsp. sugar, graham crumbs, and the spices together. Set aside. Fold egg whites, stiffly beaten and add the Cool Whip into chilled gelatin mixture. Get out a 9″ spring form pan. Press crumb mixture in bottom of the pan. Turn in gelatin mixture. Chill until firm. This is a great recipe to have when you have company over…it’s just one of those desserts that easily impress. I think there would be a lot of flexibility with the flavours that you could add as well…I could easily see this being vanilla almond, chocolate, lime, or maybe mango. It’s up to you and your imagination. This serves 8 people. What is your favourite “to impress” dessert? That is so cool how you found the magazines. When we were renovating my brother’s first home, we pulled out the insulation in the attic, which was stuffed with newspapers from WWII. Looks great. 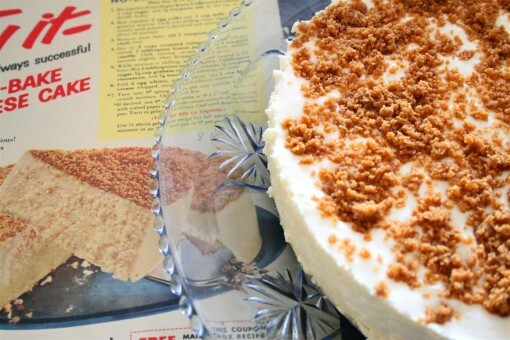 I love no bake recipes :) Pretty cool about finding this recipe in a magazine back than! Pure2Raw Twins~ Me too…the easier and faster, the better. Thanks! Wow, your cheesecake look so yummy ^^ I am sure it taste so good!